Hi, Honoré here: Lately I've been smitten by tags... you know, those sundry shipping tags that come in a variety of sizes. Perhaps it's the season since tags are pretty much on most of our minds as we begin (anyone finished?) to wrap holiday presents and/or finish making cards. 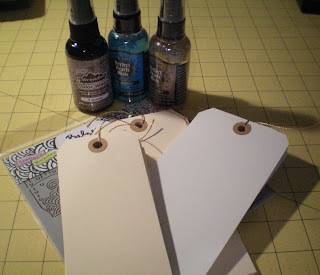 Or perhaps it's the fact that as I've visited blogs throughout this month, I'm seeing lots of clever ideas and tutorials for making tags for everything from creating shopping or to-do lists to fabric books to clever ways to package gift cards. Seems that the sky is the limit. 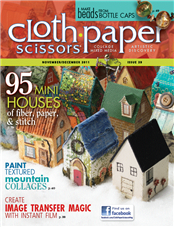 embellishments on pages in a mini album or as pages on which to mount photos from your iPhone or camera phone. 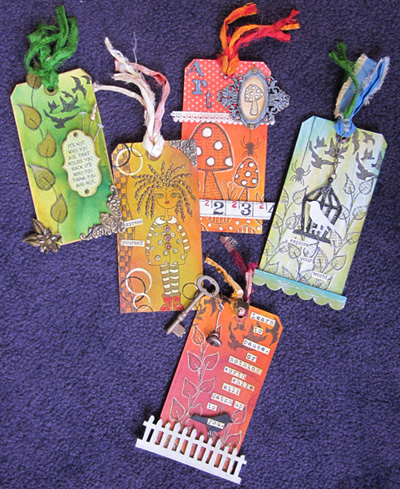 In the scheme of things, tags are really quite inexpensive and handy little things to have around. Being quite portable, you can carry them with you at all times for those unexpected free moments. And while we're on the subject of tags, have you checked out the new class - Peeled Pages -coming in January that features tags as pages? Check out the description here and don't tarry about registering: seating is limited and spaces are filling up fast. PS: This tutorial by Tammy Tutterow is a great example of creating a tag in action. And of course, you can purchase most if not all of the supplies and tools, including some of the Crafter's Workshop stencils, right here at The Queen's Ink. How about a gift from you to you? Honoré here: Yesterday, Sat Dec 4, there was lots of activity going on in the store to celebrate its 11th birthday: a toy drive, a class and a smorgasbord of tasty snacks and delightful, sinful desserts. 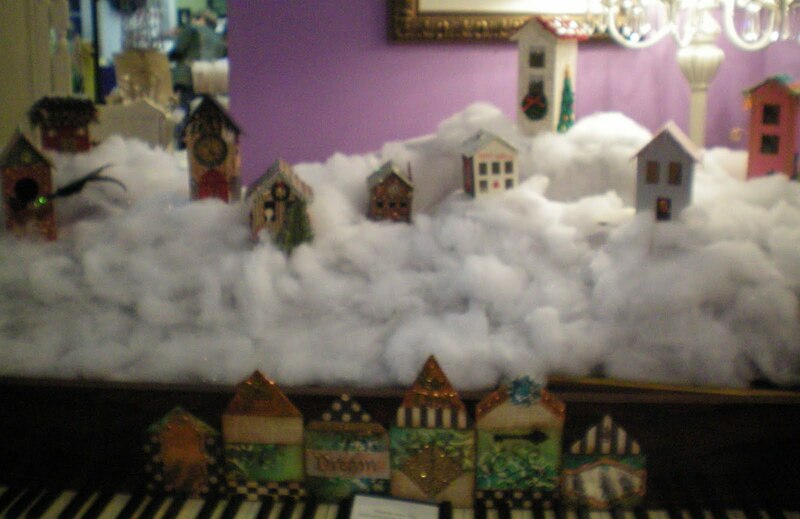 As I wandered through the store, stopping to admire the growing collection of little houses sitting on the piano, I was thinking: this store has so much eye candy and interesting things that children would love to get their hands on to explore and create. Continuing my walkabout through the store, I peeped into the class in session; the group was learning to use Copic markers and microfine glitter from Elizabeth Crafts to make really cool embellishments. 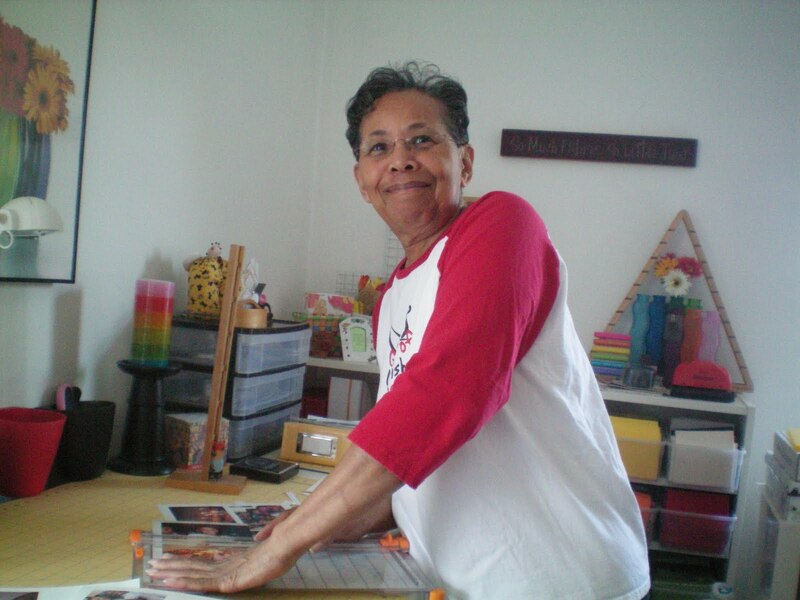 In the class was a young lady, nine years old, who takes many classes at Queen's Ink and who, in her own words, "has been making art since she started walking, oh, when she was about 18 months old." Hearing her words, memories from my childhood flooded over me. Next to reading, my absolute favorite activity was making art. I had one go-to book - whose title totally escapes me; all that I can remember is the book had all sorts of interesting things for me to do and learn. And, that is the same thought I have about The Queen's Ink... so many interesting things for me to do and learn! 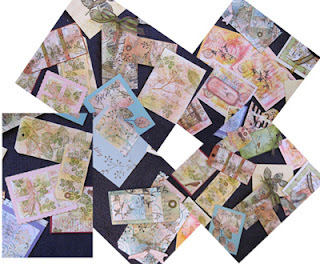 The Queen's Ink is not only for adults - there are also treasures and discoveries for children, from A - Z (artist trading cards to Zentangles). So, might I suggest that you introduce a child (including your inner one) to the treasures and discoveries at The Queen's Ink: a class; a rubber stamp; a fun mixed media project like the houses currently on display, etc. I think you'll both be delighted with your finds. Enjoy! PS. You can start with a gift certificate in any denomination you want, and certificates are good for a entire year. Hi, it's Honoré here. If you remember, earlier in October, the Queen's Ink got a new product, a gel printing plate by Gelli Arts that makes it totally possible to monoprint without using gelatin! Clearly a 21st Century advancement. In my first/last post, I indicated that I had purchased a gel printing plate and that I'd share experiences and impressions. For starters, I had fun! Really super messy fun! If you check out this post, you'll see a link to a video demonstration on how to use the gel plate. First, let me say it really is as easy as demonstrated, and clean up is a snap too. However, my workspace, hands and apron did not stay clean and neat as you'll see on the video. Or could it be that I'm just messy?! 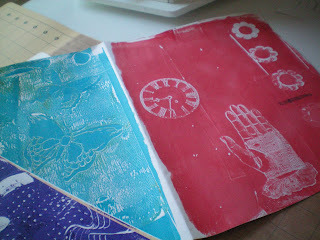 The left, teal print was made with a stencil; the right, with stamps. 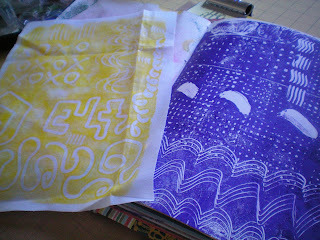 All the markings in this photo were made with the found household items; the yellow piece is also printed on muslin. I really like the texture and the clarity of the markings. Gonna have to try printing on fabrics, more. Queen's Ink has both sizes of the gel plates: the 6 x 6 and the 8 x 10. I think if you like printing and want to try your hand at a simple, fun and creative way to print your art journal pages, tags and other mixed media pieces, you can't go wrong with this tool. Let us know what you make. PS. And it'll make a great gift too; even children,I'd say ages 8+, will take to it. So, what do you Smash? Well, it doesn’t have to be a life event, just the special little moments and mementos of your day—some of that stuff in your junk drawer, for example. A snapshot, a ticket stub from that movie you loved, a newspaper clipping, a magazine snippet, a cardboard coaster from a favorite restaurant, your child’s first crayon doodle…get the idea? Smash it, jot a note or add a caption sticker, and go! This video will show you everything you need to know. The SMASH Book can travel around with you, on all of your adventures! It comes with a two-in-one pen and glue stick, so you can add movie tickets right after you see the movie AND write your review as soon as you walk out of the theater. The point of this amazing book is that it’s NOT perfect, but a place where you can jot down your ideas, glue in an idea you saw in a magazine, add bits of memorabilia – there are ENDLESS possibilities with this book!This video will help you get started, then a trip to the shoppe will get you all the supplies you need to SMASH your life. 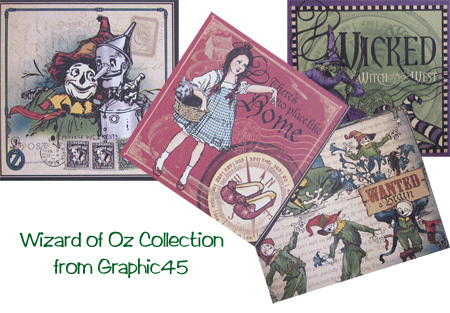 The new Wizard of Oz Collection from Graphic 45 is now in stock. I never get tired of watching the movie, and I sure do love the Scarecrow... maybe because I'm often singing to myself "...if I only had a brain"! 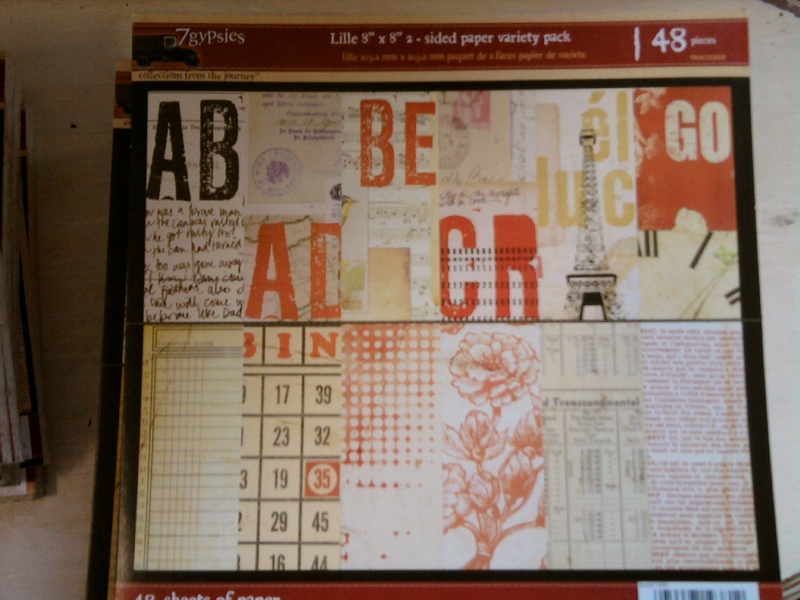 Three different collections of cling-mounted stamps are available in this collection--really cute! New and restock of bottlecap paper images in a variety of themes, cabachons, pendants and chains from BottleCap Inc.
Susan Newton is teaching a fabulous all-day workshop this coming weekend called "Creativity - There Must Be 50 Ways to Use this Stamp", a class she originally taught over 8 years ago when The Queen's Ink was located in Crofton, MD. Over and over, we've heard from our loyal royals that this one class was pivotal for them in their stamping hobby as they understood just how much mileage could be gained from a single stamp and a few different techniques/chemicals. 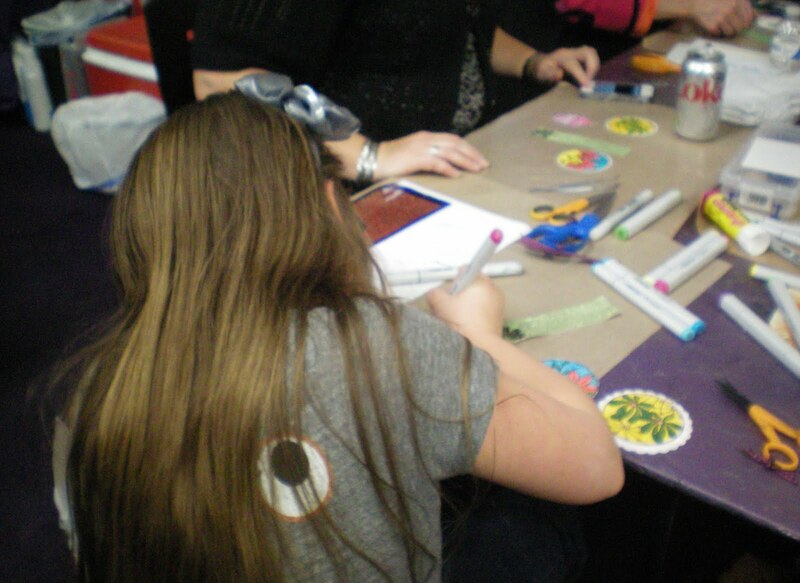 With so much change in the industry over the years, Susan delved into the new inks, papers, and processes, and updated the workshop to include even more great information. This will be a workshop to remember for all those fortunate enough to have secured a spot (both sessions offered are now full). A special Thanks to Susan for sharing her expertise with all of us! Impression Obsession never fails to impress us (ha ha, so punny). Mitra's new wood mounted stamps are always fabulous, and now she's offering very cool cling-mounted background stamps and a new acrylic handle called the "Mega Mount" which has a 6x6 surface area and makes working with the larger images much easier. Also new from Impression Obsession, we now have the Shaker card overlays and plastic capsules that make creating a Shaker card much easier. No more struggling to build the card - how cool is that?! 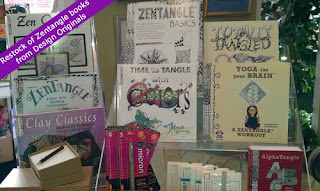 Our Zentangle display is looking pretty robust this week, with a restock of all Design Originals Zentangle publications, including the newest ones, "Alpha Tangle" and "Zen Quilting Workbook". Pay us a visit and get your own copy before they fly off the shelf! 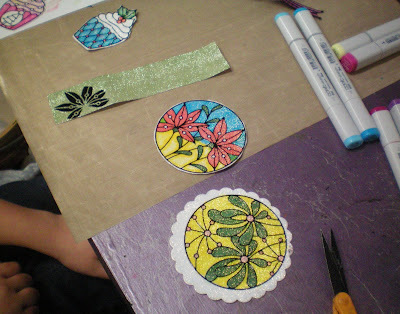 Patti taught a Zentangle Basics on Tuesday, and an Intermediate Zentangle class is scheduled for early June. Take a look at our Class Schedule, then call us to reserve your spot! 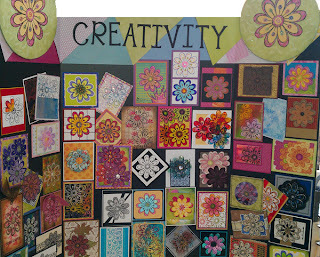 Susan Newton is teaching "Creativity - There Must Be 50 Ways to Use This Stamp!" next weekend, offered both Saturday and Sunday to accommodate our customers' busy schedules. Class size for this all-day workshop is limited to ensure each student gets plenty of attention. The display board in the shop is awesome... come by and see for yourself! 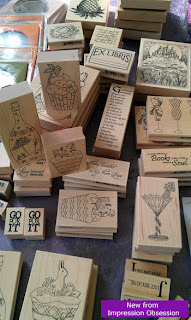 The stamp you're going to use is yours to keep at the end of the workshop - cool, huh? 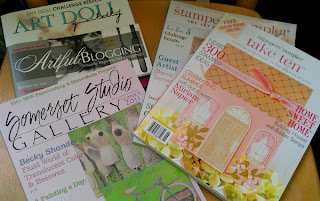 I just updated the Products list on the web... more dies and texture fades from Sizzix Tim Holtz Collection, plus new and restock of stamps and papers from Hero Arts. Our Royal Wedding Reception last Friday night was a resounding success. Patti reigned supreme in the classroom as customers created their own tiaras, plus she was the judge for the hat contest. You wouldn't know that her new knee is only 5 weeks old! She is moving around quite well, and was almost giddy just being back in her domain! She is very appreciative of all your well wishes as she continues to recover. Susan Newton hosted a make-n-take and we had 30 takers - wow! She taught a card technique that will be repeated over and over by those who learned it. I'm in the middle of putting out lots of new stuff that has T!m's name on it... boy, is he prolific! 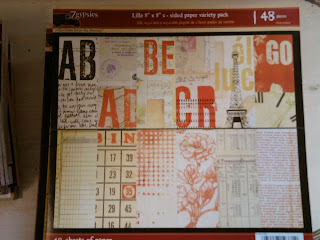 In addition to re-orders of his new cling mounted stamps some very popular Sizzix Bigz dies (Jalopy, Tag, Tray), and his Configurations boxes, we now have the tissue tape dispensers, Kraft Glassine Envelopes in two sizes and the Glassine Stash, Grungeblocks, Pen Nibs, Fractured Dolls, and Crowded Attic paper stash. We have also restocked the Distress Ink wall, including re-inkers. Hurry in cuz this stuff won't last long!!!! We all want to help the Royal Couple, William and Catherine, celebrate their special day. The Queen and her Court have been eagerly watching the mailbox for our invitation, but sadly, it was apparently lost. No worries...In true royal fashion, we will be hosting an evening soiree to toast the Royals, complete with wedding favors and door prizes and an appearance by our Queen (a.k.a. Patti with a new knee). In honor of this momentous event, we are having our biggest sale EVER!! 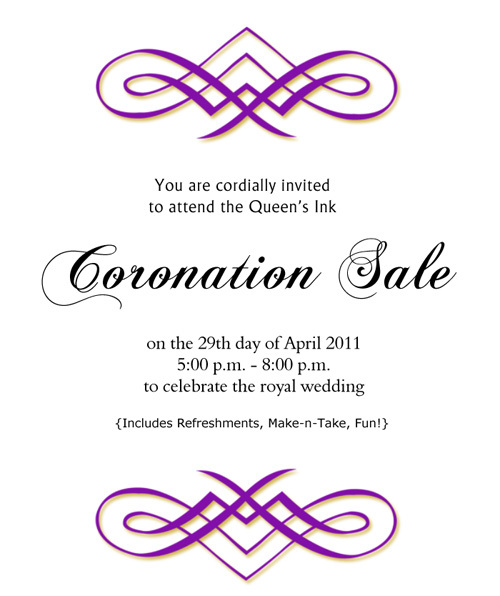 Come dressed for the occasion, eat royal snacks, do a make-n-take project, and have a little retail therapy too! 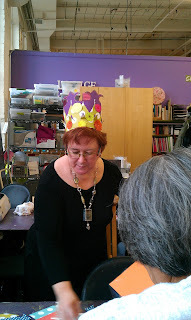 You will also have an opportunity to create your own tricked out tiara. Wear your favorite hat... prizes will be awarded for the best ascot appropriate hat! Remember... the celebration begins at 5:00 p.m. (okay, so we're about 12 hours late, but Queens do NOT arise that early, so we've been told). The shoppe is hoppin' with lots of new products and cool classes that just say SPRING! Here's to hoping the cold weather is behind us for another 9 months or so. We continue to chart the Queen's progress as she rehabs her new knee. She actually sneaked in last Sunday for a few minutes to say hello to guest artist Gail Russakov. We were all very glad to see her, especially knowing that it took every ounce of energy she possessed. She is making steady progress, but it will be another month before she's back in the shoppe for any length of time. Next Friday night, April 29th, we're having our own wedding reception at the shoppe since our Royal invitations from Buckingham Palace seem to have gotten lost in the mail. 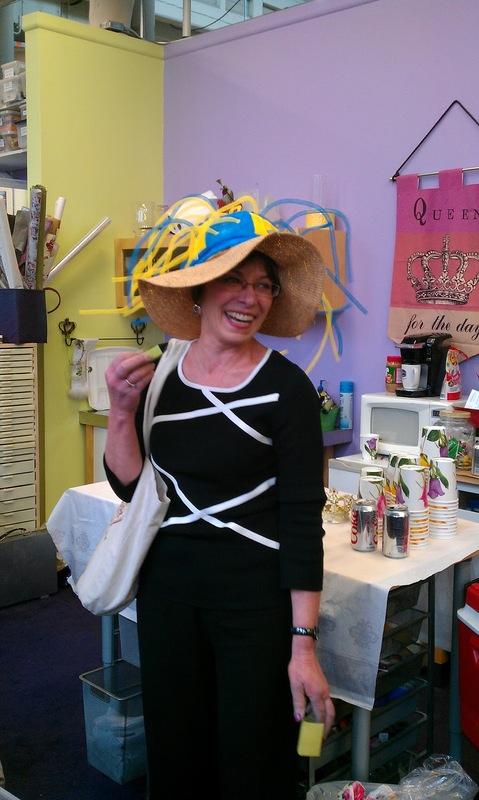 The Queen herself will make an appearance for some food, fun, and a good sale to mark this auspicious occasion. So grab your tiaras and wallets and head for Savage Mill! Well, not really a lion, but it sure is cold out there! We're keeping warm by reworking the displays and stocking our shelves with new stamps, paper, embellies, paints, and supplies. 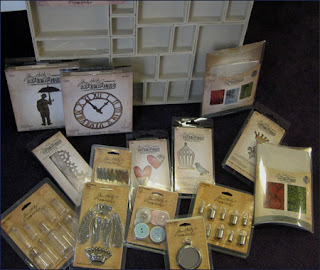 Check out the new Sizzix dies from the Tim Holtz line and some cool embellishments from Advantus' Idea-ology line. The staggered release schedule is a little disappointing, but I'm sure we'll be seeing plenty of ideas using these products. We expect more in April and May. One wall of our shoppe is decked out with the new 7 Gypsies products. Wow, such gorgeous papers and journaling tags from the new "Camden" collection! We would love to see what you are doing with these new products... send me a photo. The Queen continues her grueling rehab, and it won't be long before that new knee is ready to run the marathon (or least walk up the steps into the shoppe). She thanks everyone who has sent well wishes and asked about her. The Queen's Knee has been replaced by a new and improved model. After some royal pampering befitting the queen (that she thinks she is), she'll begin her reign in physical therapy land, and have that new knee working perfectly before long. I'll try to keep you updated on her progress. 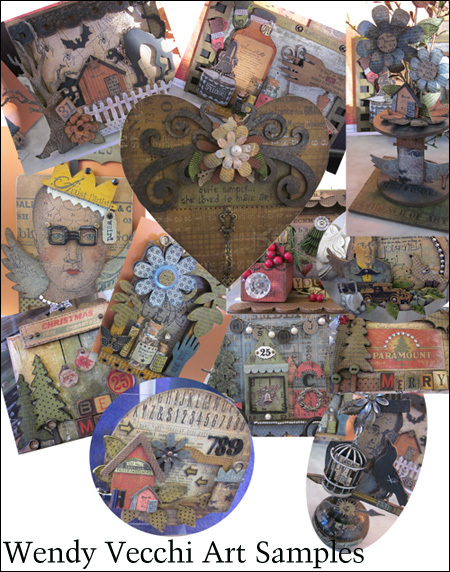 Meanwhile, back at the shoppe we're putting out the new Stampers Anonymous wood images from the Tim Holtz and Studio 490 collections. Lots of fabulous images to see. We also received new Viva Pearl Pens and InkaGold in a variety of colors. We welcome Ellen Vargo as our guest instructor for tomorrow night's Two Tag Minimum class. We sure do appreciate her help as well as her talent. If you didn't sign up this month, try to get on the list for April's class (the 15th). We have a lot of fun, and we're amassing quite a collection of cool tags. 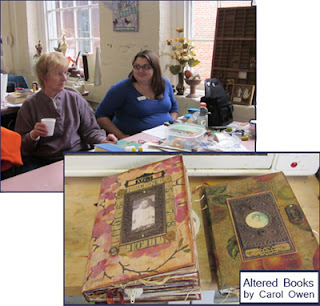 We enjoyed a busy, art-filled weekend with Guest Artist Carol Owen teaching "Painting Without Planning" and two Altered Book workshops. 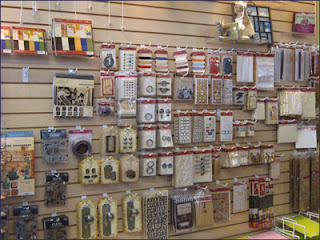 We are now starting to receive products that debuted at CHA, and I urge you to check the Products section of the website on a regular basis since I provide a list of the newest additions to our collection.﻿ Our first shipment from Stampers Anonymous included T!m's newest stamp sets as well as new stamps and Art Parts from Studio 490 (Wendy Vecchi). The Queen just told me that Wendy is planning a return visit in October... can't wait to see what she comes up with for those workshops! 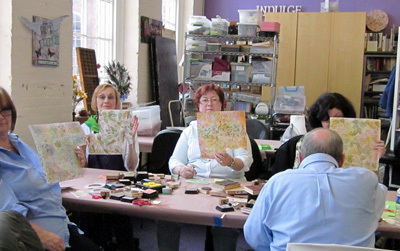 We have scheduled some great classes for March, April, and May so make sure you take a moment to check the website for details. With CHA just around the corner, many companies have offered pre-releases and we've already started receiving them. 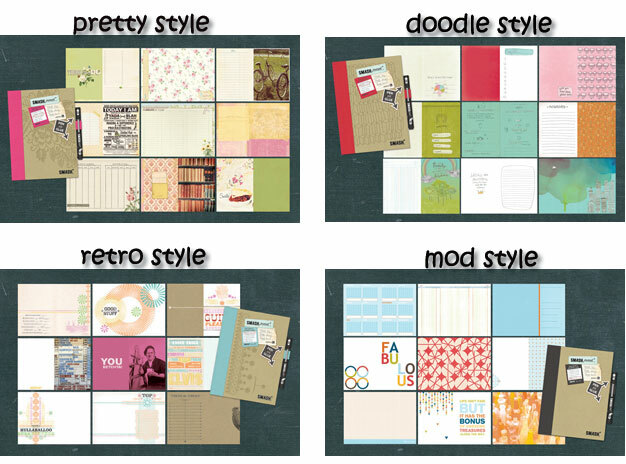 Just in today from 7 Gypsies is the "Lillie" paper collection which we have in 12x12 double-sided paper and 6x6 and 8x8 paper pads as well as journal cards and paper tape coordinates. 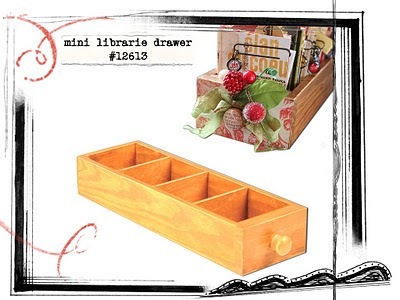 Another new product is the ATC drawer... great for collecting ATC cards, photos, or could be used as a small shadowbox. Take a look! Last week we put out the "Once Upon A Springtime" paper collection from Graphic 45, and Patti has already had to re-order the 12x12 paper pads... FABULOUS!!! Stop by regularly as we announce receipt of more new products. The Queen has pre-ordered the new Sizzix dies and texture fades from T!m Holtz, as well as the embellishments he designs for Advantus. Take a look at our class schedules... we have some fresh new offerings and some old favorites. 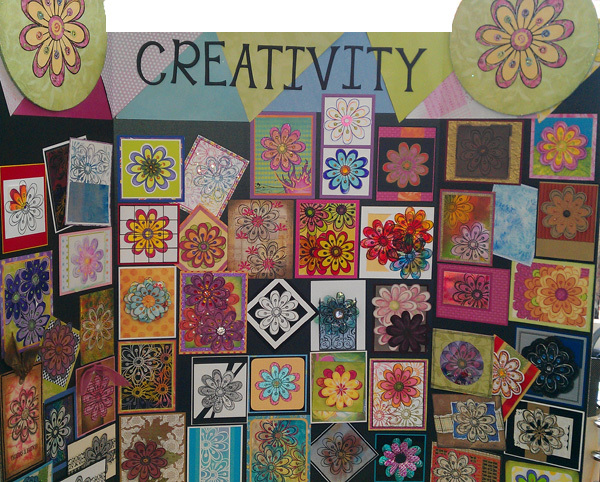 Don't miss a chance to indulge your creative self!